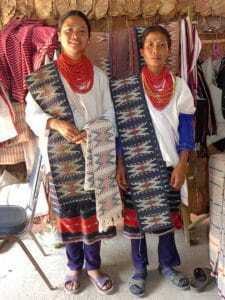 One of the least well known of Thailand’s hilltribes, the Lawa are actually one of the ancient, aboriginal peoples of northern Thailand. They preceded the migration of the Tai peoples in the 11-13th centuries and were not originally hill-dwelling. At the base of Doi Suthep, in Chiang Mai, there is physical evidence of two of their walled ‘cities’, the names of which were given in ancient chronicles. A third was on the west bank of the Ping River. In the 8th century AD these cities constituted a powerful state. 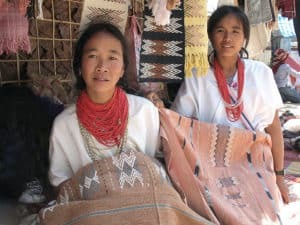 Although many Lawa later assimilated with the Tai, and the Tai with them, some groups moved into the hills with the encroachment of the various Tai peoples. Today these few traditional villages are mostly located near the border between Thailand and Burma with a population considered to be around 17,000. They live on subsistence agriculture, growing rice on terraces using a sophisticated rotation system. 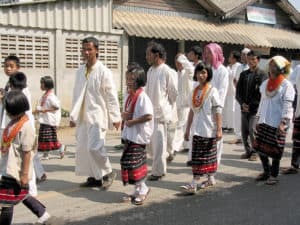 Nominally Buddhist, they are also animist, performing rituals of appeasement and giving offerings to ancestral spirits and spirits of the land. It seems that several of their important rituals were later adopted by the Tai Yuan, who became the majority ethnic group in the area. 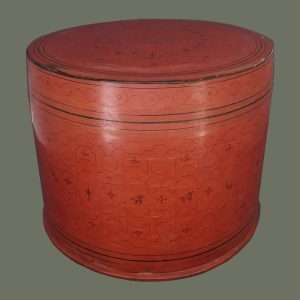 Also not well known is that they are skilled silversmiths and weavers. Often their silver work is confused with that of the Karen, but it is thought that they were the original tribal silversmiths in the area. 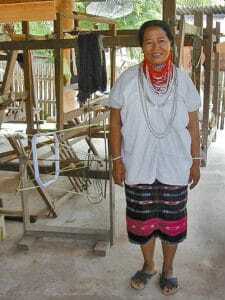 They and the Karen are the only tribal groups weaving cloth patterned with warp ikat in Thailand. 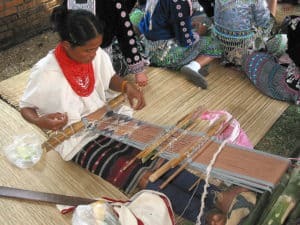 This technique, as used by the Lawa, may predate the Dvaravarti period of approximately 500 – 1100 AD (please see Susan Conway’s book ‘Thai Textiles’, p.19) The close proximity of the Karen and the Lawa may explain the Karen use of warp ikat, as well as the similarity in costume elements which include: a simple tunic top for both men and women, with matching pants for men, and a tubeskirt with ikat patterning and stripes for women and girls. 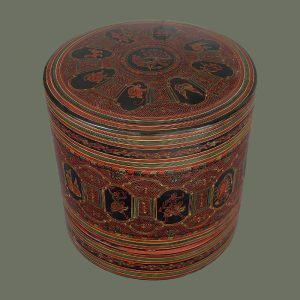 Very conservative, the Lawa do not vary the colors of their apparel very much, and use both natural and synthetic dyes. 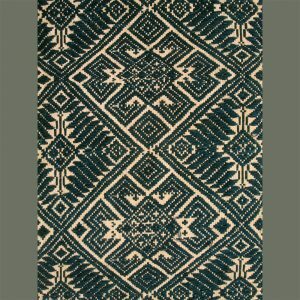 We are pleased to be able to offer a selection of their weavings, collected over a period of several years. You can see them here.